CHECK-IN AT INTERCONTINENTAL HUA HIN RESORT - I have been heard about Hua Hin a long time ago, and when the opportunity arises to visit Thailand again after not-so-summer holidays in Phuket years before, I decided to visit Hua Hin first before Bangkok and experience a new thing at this beach town. 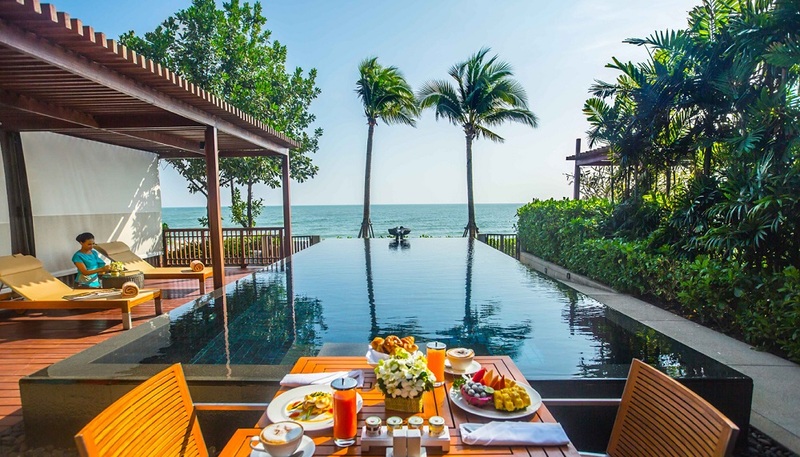 Then, I have done some research and happy to see, that there's InterContinental Hua Hin, as you know I love InterContinental Brand, and it seems that my readers agree with me. Then okay, I don't know what Hua Hin can give me, even if I just spend my time at the resort, I want something chic like InterContinental Hua Hin, I see they have major pools that enough for me to spend my time there. After 3 hours ride from Bangkok airport, I have arrived at the resort, surprisingly the resort is so close with the main street. There are two wings of accommodation and of course, I get the one close to the beach while the other wings are separated by the street. My impression about InterContinental Hua Hin is the hotel is modern with mostly art deco inspired design, with amazing spacious pools that enough for everybody, the room is quite packed but they installed a warm lighting and have a spacious balcony which is I love it. But the highlight for me is the pool, I bet InterContinental Hua Hin Resort & Spa got one of the best pool for you to enjoy this beach town wether with your family, friends and a loved one. If you prefer privacy because you are on honeymoon, you can choose the private villa with its own pool you still can enjoy the elegance of adult resort experience by relaxing and enjoying the vibes at Club InterContinental. Because I think the whole resort is most suitable for family and group of friends, but don't get me wrong the ambiance at the resort is still so lively.